Holiday time brings out the magpie in all of us, and just like our feathered little friends, we are attracted to all things shiny and reflective- all that razzmatazz that comes with a bright-light big holiday makes for the perfect excuse to paint the peacock - festive accessories! keep in mind and edit down, as too much of a good thing can wreak a simple top-knot or twisted bun. 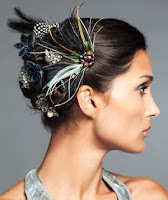 A neat French twist, high pony and the classic chignon all deserve a little dressing such as a beaded band, a sprout of feather plumes or a sparkly comb. Vintage earrings, brooches, or that favorite pendant takes a few simple pins to hold in place. It's a New Years head-turner for sure! 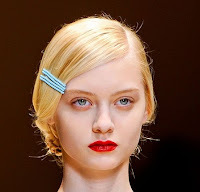 Ultra mod, quirky- a twist on the tradish - stack bobby pins close together to create a barrette effect. A deep-side part, or wavy retro locks really show of the bobby stack. Mix metals, sizes and colors to spin this style for 2013!